All classes will be held from 8:30am – 5:30pm. 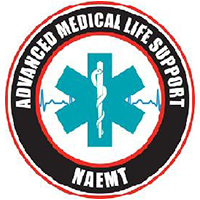 NAEMT’s Advanced Medical Life Support (AMLS) course is the first EMS education program that fully addresses how to best assess and manage the most common medical crises in patients, offering a “think outside the box” methodology. AMLS is the most comprehensive EMS continuing education course addressing the assessment and management of patients. It is for all levels of practitioners with a strong commitment to patient care, including first responders, emergency medical technicians, paramedics, nurses, nurse practitioners, physician assistants, nurse anesthetists and physicians. Identify and manage life-threatening presentations for a variety of medical emergencies, while considering comprehensive patient history, focused physical exam, and diagnostic findings. Demonstrate with proficiency the application of the AMLS Assessment Pathway to determine appropriate differential diagnoses and management strategies. Compare and contrast the concepts of clinical decision-making, pattern recognition, and clinical reasoning used in the determination of differential diagnoses.